The lovely Poinsettia. Much admired by the Christmas holiday loving set, and equally feared by dog and cat lovers. 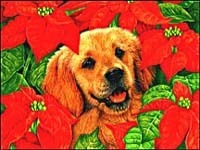 But fear not the Poinsettia, pet lovers, this lovely plant poses little threat to your four-legged family members. According to the ASPCA's website: "...plant—rumors of [the Poinsettia's] toxic potential are greatly exaggerated, say ASPCA experts." Not so fast there, Slappy. Now that you can go and festoon your home with bunches of these beauties you do still need to be diligent when it comes to your pet's contact with them. E ew. Since drooling, vomiting and diarrhea is no fun around the holidays you should probably keep Muffin and Socks from nibbling on the foliage and cleaning their teeth with the stems. But if they should happen to partake in their own version of Christmas cheer be ready with the paper towels and cleaning solution. Do you think fifty Poinsettias is too many for one house? I've got to make up for lost time. I am constantly on the hunt for the latest and greatest dog bed. There are certain criteria it must meet: Large enough, comfy enough, attractive enough, and cheap enough. This bed would not meet any of those criteria, but I'm sure there are dog owners out there who could look past that to buy one. A Furcedes dog bed? 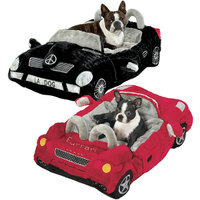 A Furrari dog bed? Are you fur-eaking kidding me? I know this product is not exactly the type of thing you'd find on this blog, but I can't help myself. I need to have my fun too. I think we can safely say you will never see one of these beds in my home. My dogs would probably think it was a chew toy. A really expensive chew toy. If you are so inclined, you can purchase the Furrari dog bed at In the Company of Dogs for the low, low price of $279.00. But alas, you'll have to wait until December 18 for the Furcedes because it is out of stock. I haven't updated this site for what seems like a dog's age, for reasons that I'd rather not get into right now, but this is my vow (to all three of my readers) that Dog Gone Blog will be back up and running in circles soon. I have posts in the works, reviews of products for that special pooch on your holiday list as well as posts on training and dog-related issues, that I want to get out there as soon as I can get myself motivated enough to finish them. Some yummy treats might do the trick. I thank the handful of you that still come here occasionally for hanging in there, for sending me emails and asking me questions about your dog's behavior. That was the motivating factor for me, my need to stick my nose into other people's business and tell them how to raise their dogs. Stay tuned for more mirth and merriment and opinions - ooh, and more Dogs of the Week! - you didn't ask for!